*This packet is included in my First Grade Year Long Math Centers Bundle. 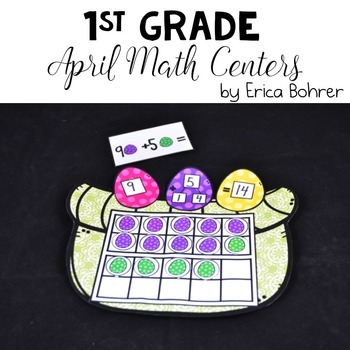 This Spring themed math packet is perfect for helping your first grade students master number bonds, facts through ten, facts through 20, addition and subtraction, make a ten to add, adding tens and ones, and comparing numbers during the month of April. 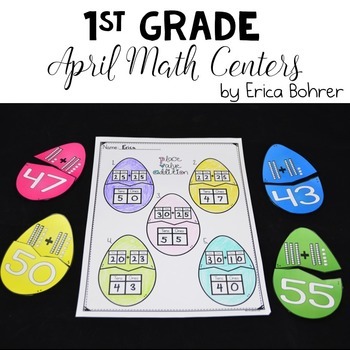 Egg-Cellent Number Bonds Facts Through 10 - Students will find the whole number using counters and an egg themed ten frame work mat. There are three choices of recording sheets. One version addition and flip the addends, second with the equal sign first, and the third complete the addition and subtraction related facts for the number bond. Egg-cellent Number Bonds Facts Through 20 - Students will find the whole number using counters and a egg themed double ten frame work mat. They will then complete the related addition and subtraction facts on the recording sheet. Egg-cellent Ways to Make Ten - Students will use an egg themed ten frame and counters to find all the ways to make ten. They will record their work and the number bond each way to make ten. Eggs in a Basket Make a Ten to Add Craft - Students will make a basket of eggs craft. They will make a ten to add using a ten frame. They will record their work on the eggs. Make a Ten to Add - Students will make a ten to add using an egg themed double ten work-mat. They will record their work. 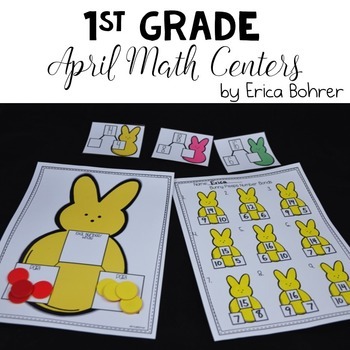 Bunny Peep Number Bonds: Find the Missing Parts - Students will find the missing part of a number bond using a flash card and a Bunny Peep themed work mat. The work mat is included if the students need it for extra support. They will record their work on a work mat. Place Value Addition - Students will add tens and ones and record their work. The problems are on break apart eggs for self-correction. Comparing Numbers - Students will take two tens and ones cards and compare the numbers using greater than, less than, or equal to. They will record their work. 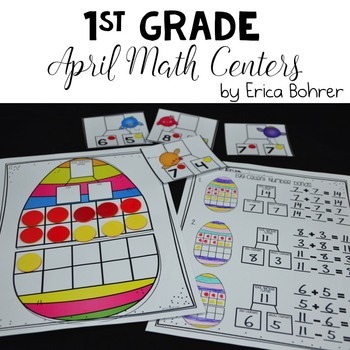 All math centers come with teacher directions, student directions, and April/Spring themed math center cards. *This packet compliments the EngageNY and Eureka Math programs for first grade.